It’s the return of NI AeroPress Championship! It will be held in the Black Box, on Tuesday 19th September. Following on from the last two years, we cannot wait to crown a champion who will go on to represent Northern Ireland at the World AeroPress Championships which are being held in Seoul, South Korea in November! The AeroPress Championships is a competition open to anyone who can brew a great cup of coffee using the AeroPress. You do not need to work in a coffee shop, plenty of past winners from countries all around the world have been “home baristas”, all you need is to secure your place online, turn up on time with your AeroPress & brew! You could be 3 coffees away from winning 1st place and going on to represent Northern Ireland at the World AeroPress Championships. 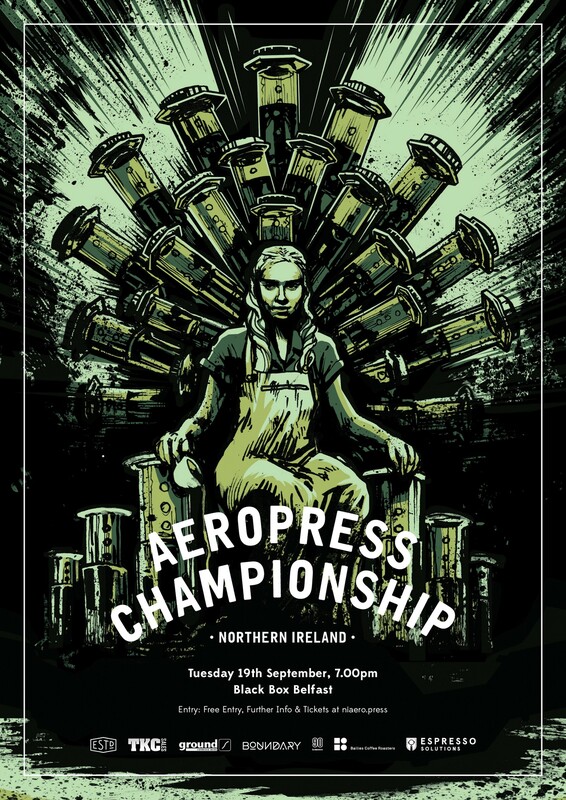 Full details below, any questions, tweet us @NIAeropressComp. As always, it’s free entry for spectators. Alongside the competition, there will be coffee served in partnership with ​La Marzocco & ​Bailies Coffee, beer from Boundary Brewing, doughnuts from ​Guilt Trip, as well as Gelato from ​Indigo Coffee, great music and more. ​Rules: We will be following the WAC Rules found he​re. 1st Place will win £1000 for flights & accommodation to represent NI at the World AeroPress Championships in Seoul, South Korea (9th November 2017). They will also receive a set of Acaia Pearl Scales, courtesy of ​Espresso Solutions, as well as a Bonavita Pouring Kettle. Thanks to Established Coffee, TKC, Bailies Coffee, La Marzocco and Espresso Solutions for their sponsorship of the 1st place prize. 2nd Place will win a Wilfa Svart Grinder, courtesy of ​Established Coffee, as well as a Bonavita Pouring Kettle. 3rd Place will win a Bailies Coffee Subscription, as well as a Bonavita Pouring Kettle. ​Coffee Sponsor: Bailies Coffee. They will be selecting a coffee, which all competitors must use. 1 x 250g bag of coffee will be supplied to each competitor ahead of the event for practise. Each competitor will then be given 250g on arrival. Judges & more info TBA, check back soon and head to http://niaero.press to keep track of information. A big thank you to sponsors: Ground Espresso, TKC, La Marzocco, Boundary Brewing, Bailies Coffee. ***SPECTATOR TICKETS HAVE NO LIMIT — FREE ENTRY TICKET DOES NOT GUARANTEE ENTRY ON THE NIGHT*** — as these tickets are free, people often request more than they need, or just secure a space on the off chance that they can go. We want the event to be a great success and want as much support for the competitors as possible, so we will be operating on a first come, first served basis.